It’s January. The gym parking lots are filled to capacity, the pantry junk food is swapped out for healthy food and the purging and organization of all areas of houses has begun. I’m always on the lookout for ways to make the organization process easier. 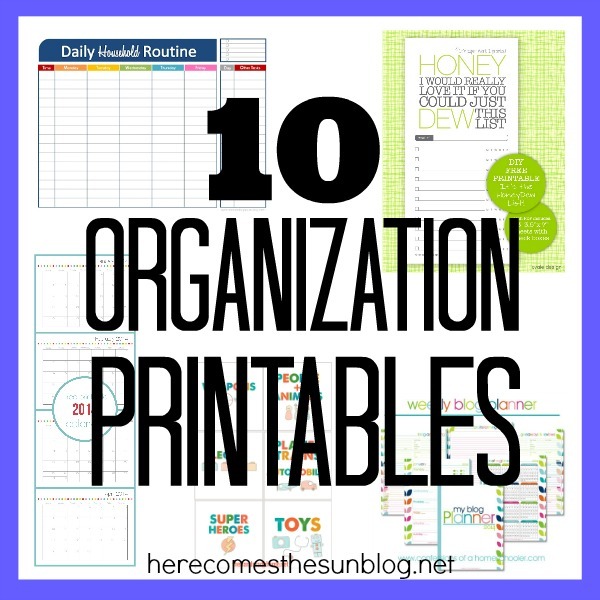 If you don’t already know, I’m a big fan of printables so I’ve rounded up 10 Organization Printables to help you tackle the clutter and schedule your life! I have included printables that will help you organize many aspects of your house and/or life. If you are a blogger like me, be sure to check out the blog planner printable. Click on the links below to be taken to each printable. What a fantastic resource. I especially like the Chevron Labels and the Monthly Budget. These will be so helpful. Thank you for taking the time to put this together. Great post! I love the chevron too! I’m glad you found this useful! You’re welcome, Erin! I love your design!